SNR pumpkin carving competition is at 3:30 p.m. Friday. 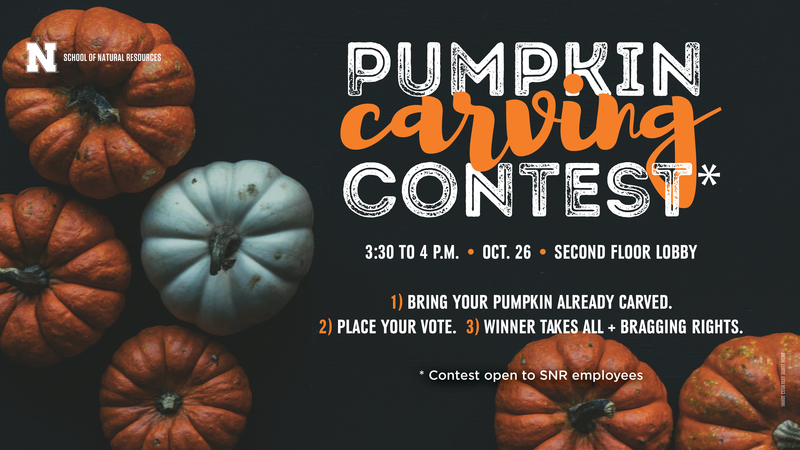 In the spirit of fun, the School of Natural Resources is hosting a Pumpkin Carving Contest for SNR employees Oct. 26 in the second floor lobby, with prizes for the first-, second- and third-place winners. Participants should drop off their already-carved pumpkins on the round tables in the second-floor lobby Friday morning. Label your pumpkin with your name and the category you’re competing in. Votes will be collected in two clearly-labeled buckets until 3:30 p.m., when they will be counted. Please vote only once per category. Winners — who will earn a year of bragging rights (and a small prize) — will be announced during the festivities.